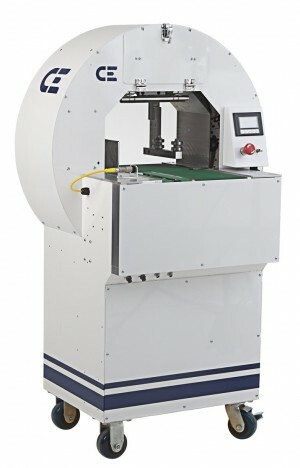 CE is proud to add the new APT Series to its innovative and versatile family of stretch film banding equipment. The APT Series is a “plug and play” system that can be used on its own or upgraded and customized to fulfill specific banding requirements. The superior reliability, easy operation and low cost of ownership make this the ideal banding solution. Eliminate redundant handling; don’t bring the work to the bander, bring the bander to the work. The sophisticated design provides all the benefits of full automation while maintaining a small enough footprint to easily move from workstation to workstation. Banding is hardly a new concept. CE has simply perfected it. With the Reactive Tension Control, the APT redefines the standard for bundle integrity. This system automatically adjusts to varying product sizes and shapes while still allowing the operator to finitely control the bundle tension. The CE Reactive Tension Control system automatically adjusts for varying sizes and shapes of products. This system also provides the operator finite adjustment settings for superior bundle integrity. MPT Series bander use a banding material that is a fraction of the cost of other banding consumables; often providing an ROI solely on consumable savings in less than 6 months! The APT Series are designed and manufactured to require NO PREVENTATIVE maintenance. By using the highest quality, precision machined components, each CE Bander can perform even under the most demanding production environments. APT Series banders are designed, manufactured and assembled here in the United States of America. Industrial grade components, exacting design and manufacturing standards are behind the trouble free operation and performance. Automatic roll changes help keep the bander doing what it does best; keeping your line running. CE Reactive Tension Control System gives you the ability to band a single brochure and still give the strength to securely hold a 20lb mail bundle. A small footprint, 110V power and standard house air allow this bander to move easily from workstation to workstation. APT Series banders use 100% recyclable LLDPE banding material that can be comingled with existing stretch film recycling programs.